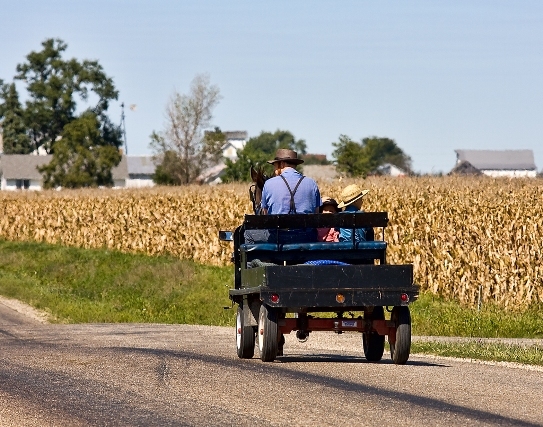 The Amish community near Arthur and Arcola is the largest in Illinois, with a population of around 4,000 Amish. Other Amish settlements are found across the state, particularly in the southern and western regions. The Illinois Amish population was nearly 7,000 as of 2010, spread over 19 communities and 49 church districts (Young Center 2010). The Arthur Amish community is the largest and by far the oldest Amish settlement in Illinois, founded nearly 150 years ago. The settlement is centered around Arthur, a small town of around 2,000 souls. Amish homes are located in both Moultrie and Douglas counties (the county line bisects the town) as well as a few in Coles County to the south. Amish homes and farms extend in all directions, as far east as near Arcola, towards Sullivan, the seat of Moultrie County, in the southwest, and to highway 36 to the north. The Arthur community was founded in 1864, by Amish from communities in Pennsylvania, Ohio, Indiana, and Iowa (see A History of the Amish, Steven Nolt p 232-3). The Arthur Amish were not the first Amish community in Illinois, however, with two settlements having been founded in the central part of the state in the 1830s. But the Arthur community was destined to grow and ultimately survive, while the others eventually disappeared. The Arthur Amish community has grown to 28 church districts as of 2010 (see Young Center, 2010), comprising well over half the Amish population in Illinois. While Arthur Amish do not face quite the same external population pressures as Amish settlements in the east, farmland is still quite expensive, a factor that has affected occupational patterns in the community. Nonetheless, numerous Amish at Arthur do maintain traditional dairy farms. The terrain of the Arthur community is buggy-friendly, generally very flat and with paved roads. Common names in the Arthur community are Miller, Kauffman, Gingerich, and Schrock. Less-common names seen here include Jess, Otto, Diener, and Rocke. While agriculture remains fairly common, Amish at Arthur work in a number of other trades. Some work for large overhead door manufacturer C.H.I. and can be seen bicycling to and from work at the local plant. Other Amish in the Arthur community are known for their small business activity, in particular furniture and wood-related enterprises. Arthur is home to a thriving Amish business community, with many Amish operating businesses in wood-related industries. Lower-end wood businesses are found at Arthur, such as pallet makers. More frequently seen are higher-end operations producing cabinets and furniture. These number in the dozens and employ hundreds of Amish males throughout the community. Arthur furniture businesses attract consumer attention from urban areas such as Chicago, St. Louis, and Indianapolis, all within a three-hour drive. Find an Illinois Amish furniture business. In addition to furniture, a number of other Amish-operated businesses can be found. One Amish family operates a jelly-making and canning business. Another runs a small bookstore catering to the Plain community. Machine, metal, and engine shops are also found throughout the Arthur settlement, as are construction businesses. As one of the largest Amish communities in the Midwest, Arthur has a fairly developed tourist industry, welcoming visitors from across the region. Additionally, the area is home to an Amish interpretive center found at Arcola, which specializes in educating the public about the Amish and Anabaptist peoples, as well as more traditional tourist activities. The Arcola center features a museum, gift shop, and organizes home, farm, and business tours. At least one Amish family in the Arthur community hosts non-Amish visitors for meals and overnight stays. Rockome Gardens is a longstanding tourist destination located in the community. Rockome features “rock gardens” comprised of numerous rock formations and stone fences, as well as a number of other attractions. While Arthur is by far the largest Amish community in Illinois, there are numerous other small Amish settlements found throughout the state. After Arthur, the next oldest Illinois Amish community is located at Mt. Vernon in Jefferson County—founded over 120 years after Arthur, in 1987. However, since 2000, the state has seen a good measure of growth, with at least ten new Amish communities founded. The community at Macomb in McDonough County in western Illinois at one time had 3 districts but has recently shrunk to 2. This community is more conservative than the Arthur Amish. 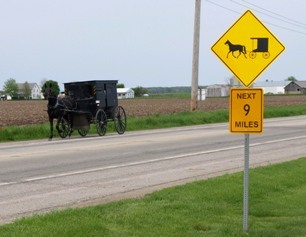 Most other Amish communities in Illinois can be found in the western and southern portions of the state. Amish are found in Wayne County, home to 3 settlements, Jefferson, Jackson, and Pike Counties (home to 2 settlements each), and a number of others. None of the other Illinois Amish communities exceeded 2 church districts (meaning roughly 300 baptized and unbaptized individuals) as of 2008 (Amish Settlements Across America: 2008, Luthy). A number of Amish settlements which once existed in Illinois no longer do today. A few were of significant size. The community in Tazewell and Woodford was formed in 1831, in large part by direct immigrants from Lorraine in France. Over the next 20 years, around 130 Amish families moved to the area, and by the early 1850s, five congregations had been formed. Amish historian David Luthy tells us that at by this time, the Tazewell/Woodford settlement was larger than the Lancaster County settlement, and equal to or larger in size than the community at Holmes County, which had been founded over 20 years before the Tazewell/Woodford community (Settlements that Failed, Luthy pp 75-80). Eventually Amish in this community were influenced by progressive movements which were in the ascendant in America at the time. Amish in the area began to build meetinghouses, typically a key step in the journey from a traditional to progressive alignment. Many Amish at Tazewell and Woodford Counties eventually formed the “Western District Amish Mennonite Conference” in 1884. Some congregants in this community also joined other movements, including the “Egly Amish” and the “Stuckey Amish” groups. 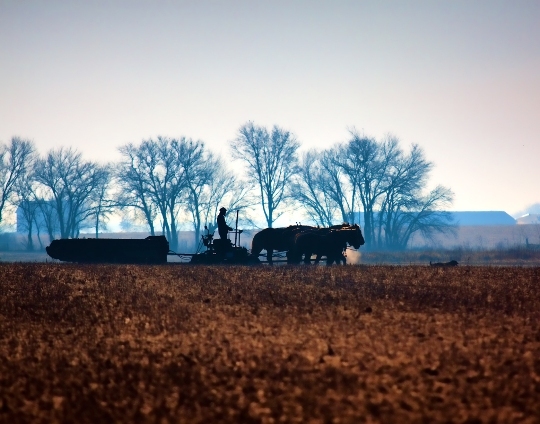 At the time, many other Amish settlements which were affected by progressive change (such as the Kalona, Iowa Amish, or Elkhart/Lagrange County community in Indiana) formed an Old Order element as well, which kept to traditional practices and beliefs. Such was not the case with the Tazewell and Woodford County settlement, which is why no Old Order Amish are found today at what was once one of the largest Amish communities in North America. As a result, Luthy notes that many Amish surnames found in this community are unseen anywhere among Amish today, such as Yordy, Roggy, Litwiller, and Klopfenstein (Settlements that Failed, Luthy, p. 80-81). 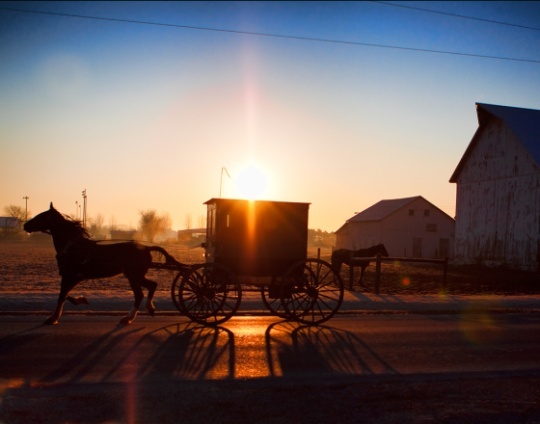 Another Amish community was founded in 1835 in Bureau and Putnam Counties, also in north-central Illinois. In a sense, this community followed a similar progressive path as that of the settlement at Tazewell and Woodford Counties, with member eventually joining the Western District Amish Mennonite Conference mentioned above. Illinois is a state with a long history of Amish settlement, today represented primarily in the sizeable Arthur community. Though Arthur is by far the largest Illinois Amish community, Amish have been attracted to settle in other areas of the state. In fact, Illinois is listed as a “High Growth State” by the Young Center for Anabaptist and Pietist Studies for the 20-year period 1991-2010. According to the Center, the Illinois Amish population increased by 133% in this time, well above the average. Some of this growth can be attributed to in-migration from other communities. The community in Saline County, for instance, originates from a Wisconsin Amish settlement. Excellent information, loved this article!! Thanks so much!! Yes, excellent! I am curious to find so much to read and study about – and maybe an extra visit… one thing of note – last year (or early in 2010, I can’t remember), Rockome Gardens again changed hands. I canot remember the details (didn’t know many anyway but can’t remember names just now)but, the Amish Interpretive Center was moved from Arcola to Rockome Gardens. This may be convenient for those going to Rockome but, I miss its convenience to I57 and US45. I think Arcola misses the people it brought to places like the Dutch Kitchen, the Daily Kneads Cafe, and the little unique shops in the downtown area especially with the leaving of the Anne and Andy museum too (they still celebrate Broom Corn Festival). I stumbled across this change when I took my husband to see the Interpretive Center and there were carpenters taking it apart! (some were Amish) Thankfully, they allowed us to look through a little so my husband had some exposure – it created so many questions and some I couldn’t answer. A couple of Amish ladies recently (past couple of years or so) opened a little ice cream/dessert/coffee/sandwich (it grew, can you tell) shop right on rt33 as you come into Arthur from the east that is very popuar. Ok, enuf! Now, on to more education on the historical info. thanks again Erik! Amy Jo, thanks for the question and letting know about the Interpretive Center moving to Rockome, I did not realize that. And I will need to visit the Amish ladies’ ice cream shop when I’m next in the area. Will be looking forward to that trip. As for the bookstore, I wish I had the exact coordinates–I can tell you that it is on an east-west road south of Arthur and on the Douglas county side (ie, the south east “quadrant” if you look at a map with Arthur in the middle). The shop is on one of those roads not far out of town, I think it can’t be more than a couple miles (assuming it hadn’t moved in the meantime). I believe it is on the south side of the road. I wish I could remember the name, and I don’t have my directory with me at the moment unfortunately, which might help. Amy Jo, you’ve also got Clearview Fabrics and Books, which is not the one I was talking about but is about a mile or so northeast of town, I believe this is an Amish place as well. You can probably ask at Clearview about the locations of other stores as well. Arthur area is pretty easy to get around with its mostly grid roads. On that note I am going to have a proper business directory for each one of these state entries but have not gotten around to it yet! Thanks Erik… I think I know the area you are talking about for the bookstore – I’ll have to explore a bit. May be somewhere near Miller’s Dry goods – I hear one of the family members there either is very il or may have passed. It is still open but I am not sure how it is doing. i have purchase material there and also at Clearview. Actually I have purchased books and cards at Clearview and at Miller’s. My first visit to Clearview was not too long ago actually – didn’t know it was there until I asked at the place we had our kitchen cabinet doors made… and asked the casket maker’s (Obie Obadiah Helmuth) wife when I was visiting him about making a casket for me. Of course the Family Health Food store (can’t remember the name) which is about 1/4-1/2 mi so of 133 on the county line (Doug/Moultrie) is a great place for all things vitamin/supplement as well as organic foods and some kitchen stuff and books/cards… very helpful there – as most places. There is a great book written by a Champaign newspaper journalist about the Arthur Amish. I thought she did a great job and had good photography as well. I think, also, the Beil (?) gentleman has done well with his photography/book of the area and I think you have had some of his work on this site too. Ok, too wordy (and, you can probably tell I am also the ‘Amy’ from IL… the one that is too wordy)… need to clean the gutters. Keep up the great work here! I like bikes. Locally the bike trailers I’ve seen don’t look as substantial as theirs. Great article. My gg grandfather was one of the first amish to settle in Arthur. I have many amish cousin’s still living in the Arthur area. Marcus–appreciate it, and especially nice to hear from someone with roots in the community. I have many fond memories of Arthur. Amy Jo, always great to read your comments, and don’t every worry about being wordy 🙂 And hope you’ll let us know if you track down the bookstore! I am aware that some Amish communities are renown for making corn brooms. Does the Amish community in Arthur make corn brooms for the Libman broom company in neighboring Arcola? Adam, a good question on the corn brooms. I don’t have an answer at hand but maybe someone reading this does? Terry,,,, being in Peoria you might want to google “Amish Cabinet Makers in Illinois”. I believe there are cabinet makers in both Arthur and Arcola, IL Amish communities. The other search you could do would be just “Arthur, IL” as I believe they have a list of the Amish businesses down there and that would give you some good leads. Terry, My husband and I had an amish Arthur cabinet maker make our cabinet doors (we refaced our existing cabinets but had new doors put on)about two or three years ago. The business is Rocky Lane Woodworking, Willard & Rosanna Schrock, 55E CR 300N, Arthur, IL 61911, 217-543-2160. He is one of many competent cabinet makers in and around Arthur. Adam, I have not known any Amish to work at Libman’s or Monohan’s (the other broom factory in Arcola) but I would not be surprised. there is a very large amount of Mexican’s employed at Libman’s though. Most of the Mexican population in the Arcola area come from the same area in Mexico. Truly, little Douglas County Illinois is quite the diverse, interesting place! The people in Roseville you are talking about are Mennonite, not Amish. I do business with them. They live 4 miles from my house. I believe the store on route 116 just east of US 67 is Amish. Further down the road the same family also have a furniture shop. All custom made. The store leases trees from my wifes family for syrup making. The also contracted to build an out building and small bridges for my father in law. Wonderful people at the scratch and dent store. If you are in southern illinois in Opdyke Ill malinda mast has country store and her phone number is 618-756-2250 she can usually order you something if you dont see it in her store. excellent place to get baking supplies, flours, wheat berries etc. very nice family store you will enjoy. www.discoverbulk.com, the first two stores are within 50 miles of Marion, Illinois, plus more stores are between 50-100 miles away. You may want to phone to verify the information. These bulk food stores are not all Amish. and Mast Family Country Store in Opdyke Illinois on Lighthouse Lane phone number is 618-756-2250. I come from the Tampico Illinois (black car) Amish Mennonite community. I am doing a series of video in Pennsylvania Dutch. This one is from my farm and as you will see they use modern machinery. I own a home in southeastern PA, that has Amish made cabinets installed in the early 1950’s. I just came across the original cleaning instructions, and it recommends Johnson’s Cream cleaner. Is there anyway of finding this product, or a similar? I am only assuming that it was an Amish made product, and do apologize if I assumed incorrectly. I meant the cleaner only, as I know the cabinets were certainly Amish built. Mr. Simon Yoder of Mt. Vernon Illinois phone 618-214-9782 is amish and said they use a product called KLEENS ALL on their cabinetry and he can get you some if you would like. Mr. Yoder also has a very nice green house selling plants every spring on Log Cabin Road in Mt. Vernon that you may like also. I posted this here only because it has to do with a family who are OOA members in the Arthur area. Earlier today I called a family on their phone shanty telephone. I hadn’t previously saved it into my cell contacts so I went to do this. When it came time to put it in a category ie: Home or Work, I actually had a moment of hesitation and thought hmm, which one?? It was located in a phone shanty….They do have a greenhouse business though but I decided to put it in the Home category. I amused myself though. Do you have any information as to whether that is still the case, and if so, any contact information? My husband and I are planning a visit to Arthur next weekend and have tried to find that type of lodging, with no success. We have had the privilege of staying in Amish homes in Ohio and Pennsylvania and would love the chance to do the same in Arthur. I would certainly appreciate any information you might have. Pam I just sent you an email on this. I am also interested in the Amish family that hosts overnight stays. My husband and I are looking for a little getaway and this would be ideal. I would appreciate if you could send me the information as well. I would also like information on homes that offer their home for the night and also meals. Is there a list of Amish Mennonite stores that are open in St. Peter area other than Zimmerman’s Greenhouse and the General store? I can’t seem to find a link and map that they used to have at the Vandalia Tourism Center. Any help is appreciated as I’m going there Saturday 5-11-13 from St. Louis. Thanks. My husbands friend said he got home school books from the amish and other good around salem illinois. Do you happen to know of any around here? I know there are Old Order Mennonites at Vandalia because a friend of ours drives bus loads of Old Order people from PA to IL for weddings and funerals. I will see if they can tell me anything. We have visited a church east of Mount Vernon (further south) but one of the ladies there told me if you want “plain shopping” you mostly have to go to Arthur, IL. We are moving to the Metro East area of IL, NE of St. Louis for a job transfer and sure wish there were more plain people closer. Church will be 100 mile drive for us probably. If you contact the Tourism office in Vandalia, they have a brochure “Dutch Prairie Mennonite Shops” which they sent me. 24 shops and produce sellers who are 7 mi. south of Vandalia, and east of Hwy 51 in the Vernon/Shobonier/Augsburg/area most of them south of Zimmerman’s greenhouse. My next trip to IL, I plan to check this out. There is a nice assortment of businesses. There is another little town I was told about with shops, I think it was Campbell Hill, IL. If that is correct, it is southeast of Sparta along Route 4, and northwest of Carbondale. In a comment from March it was mentioned that there is an Amish family that hosts overnight stays along with meals. I have been going to Arthur since I was a little girl and would love to stay with an Amish family. I have eaten at several homes but was not aware of anyone offering to let you stay overnight. I would appreciate if you could send me information on this. I am looking to have a barn built in Northern Illinois (DeKalb area), and I am very interested in having the Amish build this barn. Does anyone have any suggestions as to whom I can contact within the Arthur Amish community or another Amish community in Northern Illinois? Does anyone know if the Furniture store in Arthur makes bedroom suits? I am thinking of buying a birch wood one from Montanawoodworks.com but if I can get one here in my own state and help my own Amish folks, I would do that. No I am not Amish but I respect and admire the heck out of them! Also, about the custom quilting, how does that work? Do you give the pieces of clothing, pay for it and come back to pick up your quilt or do they mail it to you? ANY help would be much appreciated! Gail there are many furniture businesses in Arthur area and bedroom suites are among the many things they make. There are a number of retail stores as well as Amish manufacturers in the area, and you should find bedrooms in many if not all of the retail places. Here is a list of furniture businesses in Arthur area, the ones listed as Amish may or may not sell retail, but the ones further down the Arthur part of the list are pretty much all retail stores around the Arthur area (Arthur, Arcola, Tuscola). As for custom quilting, not too sure, the way things work may depend on who you’re dealing with. I’d suggest just inquiring with the people you have in mind. I’m thinking of making a trip to some of the Amish communities in southern IL, possibly during the peak colors of autumn. Anyone have any must-see spots? Anyone know where I can find an Amish directory that includes these settlement? Hey. I’m still interested in input, ideas — and esp. any information on an IL Amish Directory — for a trip to the southern IL Amish settlements. The stores may be able to give you leads to other businesses. However, the bulk food stores don’t seem to be very plentiful in Illinois. Thanks for the Tazewell information. That is where my family first settled in this country. I still don’t know if they were Amish or Mennonite when they came, but my part of the family was Apostolic Christian when they left Illinois around 1900 for northern Indiana. I think the Apostolic Christians were more Mennonite by then. The rest of my Zimmerman family is still in that region of Illinois, but I doubt any are Amish. Do you know whether the original Zimmermans were Amish? I don’t think so Barbara. According to this article in GAMEO the name goes back pretty far in Anabaptist Europe, even to the 17th century, but I haven’t seen anything explicitly linking the name to a member of what would be considered an Amish congregation. The oldest one mentioned is a “Swiss Mennonite” family which came to Pennsylvania in the late 1600s. As for today, I have never heard of any Zimmermans among the Amish unless there is some obscure case I haven’t come across. Of course as I think you know it is seen among Mennonite churches. I know some Amish Zimmermans in Goshen, IN, but we’re not related. They’ve been there as long as I can remember. I also knew some Jewish Zimmermans in Muncie, but that name was not original with them. It was just the closest spelling. I, too, think my family was the Mennonite side. They originated in the Germany/Switzerland area. At least as of 2012 there are no Amish Zimmermans in the Elkhart-LaGrange Old Order amish community. Here in northern Indiana, the Zimmerman family is associated with the Mennonite churches such as the Wisler mennonite community. Quite a bit has come out since this. My Zimmerman family came from France, after expelled from Germany, Switzerland, etc. Two brothers and at least one sister came to Tazewell County. The sister married a Roth and became the matriarch of the Roth family in Illinois. Family history shows she was Amish. The brothers’ families converted to New Amish (Apostolic Christian) soon after arrival, which is why we don’t see Amish Zimmermans. Plus, it looks like they favored the Mennonite wing. By the way, readers interested in tracing Amish/Mennonite roots – do a web search for the Amish/Mennonites of Tazewell County. They have a huge historical record of the settlers and descendants that is downloadable. It was just updated this May with many more results and some DNA information. about being hosted by an Amish family..
Great article young man! I live in Champaign, just uP the road I57 a bit! Whom would I contact about having a family host me and my wife? Growing up in “little Chicago” (Champaign) I’ve been yearning to leave the rat race of our big ten university town after 50 years. As of recent, I’ve taken on a job in agriculture that takes me (about twice, three times a month) to Cadwel just southwest of the heart of Arthur about 4 miles. Thank you again for a great read. Perhaps it worked at that time however it leads back to this page of Eriks… Here’s the Arcola Illinois broom corn festival link. Is Rockome Gardens not open to the public anymore? The last time I was there was in the middle ’90’s’. still open? It used to be in Arcola but moved to Rockome Gardens a few years ago. Thanks for this information, Linda. I hope the Amish Museum can find a new home. I visited it several times in Arcola and think it is a worthwhile feature of the area to help visitors learn about Amish history and life in the Arthur/Arcola area. I’ve never known about the former settlement in Bureau County. I used to live in Kewanee, in the adjacent Henry County, and I didn’t know about it. My mom went to college in Macomb (and sometimes, I went with her, by that point, she already had four kids). I’ve not seen the Arthur community, and I’ve been to Mt. Vernon MANY times, I am sure I have seen Amish there, I just didn’t know that’s what they were. (I hope I’m reading everything wrong, it’s either really late or very early).